This paper looks into the root causes, rules, regulations and standards that contributed to a fatal accident in the construction industry. A tragic accident occurred. An employee of a site development contractor was transporting a single drum roller when it inadvertently crossed over the grade, its smooth bore drum sliding down the nearby incline causing it to roll over - crushing and killing the operator. It is sad to realise that tragic events bring us to the most reflective consideration. What happened? Who was involved? What actions or inactions played a role? What ancillary issues, pressures and events contributed? What regulations, rules, standards and consensus documents applied? How do regulations offering ‘should’ and ‘shall’ compare to prevention and root cause issues? Where along the cascading events that lead to tragedy would actions have played the biggest part in preventing the occurrence? A rubber tyred, single drum steel roller was involved. A contractor was performing site preparation work for building additions and surrounding elevation improvements. While being operated by an experienced employee, the vehicle was travelling down the side of a private road near the edge of an embankment covered in grass overlay. Given the time of year, it was cold and the ground was wet. For reasons unknown, the operator was transporting the vehicle along this route directly adjacent to a private roadway. At some point, either due to inattention or miscalculation, the operator allowed the flat surface steel drum to go over the edge of the embankment, at which time the smooth surface drum lost all traction, slid down the embankment out of control and overturned. During this process it became evident that the operator attempted to extricate himself from the vehicle and in so doing was crushed by the equipment. He died as a result of his injuries. The primary issue raised by this incident was whether or not roller compactors are required, in all cases, to have rollover protective systems (ROPS). The greater question also presents itself: should all equipment used on construction projects be so equipped? This is where we begin the process of evaluation, by looking at the Occupational Safety and Health Administration’s (OSHA) regulations, local and state regulations (in this case, New York State) and consensus documents offered by various bodies such as the American National Standards Institute (ANSI) and the American Society of Testing Materials (ASTM). Given that rollers have multiple uses on projects it is clear that exposures are often presented when this equipment is used on slopes or elevation changes. This would require protection of the worker in the operating compartment in the form of ROPS and use of the seat belt. It is also well known that rollers are used only for flat surface preparation. They essentially compact the surface to obtain a specific surface and terrain density in areas where no slopes are involved posing, therefore, no upset situations; for example, parking lot preparation and asphalt application. A literature review was undertaken to determine the best management practise in an attempt to see what the industry expects, even when regulations may not be crystal clear. Further, a root cause analysis was undertaken, utilising this information in an attempt to make a determination as to what causes or primary sub-causes were involved and, as is often attempted, to pinpoint a specific causal factor that would have prevented the occurrence if more prudently handled. Without a doubt, the regulatory review brings us into an area of ‘should’ and ‘shall’. A review such as this cannot escape the ancillary impactors or external forces that may have played a role in the actual events. Events such as this always lead to both a legal conclusion and a root cause conclusion. One may not necessarily be the same as the other. This was the main point of contention related to the legal or civil litigation. Regardless of the regulations’ clarity, this paper attempts to uncover the actions necessary to prevent this occurrence. The problem that presents itself is the prevention of a serious accident and determining what actions could have prevented it. In reviewing this problem an intense look at the regulations is necessary to see if they were inclusive of enough detail and specific required expectation which, if followed, would have prevented the incident. In this review, the assumption is made that if ROPS were provided on the roller in question, the operator would have used the seat belt, thereby preventing the fatal injuries. When an upset occurs causing vehicles to roll over, one of the leading causes of accidents when they are equipped with ROPS is the operator’s failure to use the seat belt. This can lead to serious or fatal injuries when the ROPS itself causes the crushing injury after the ejection of the operator. For our purposes, as noted, we will assume that the operator would be belted. The purpose is to analyse which regulations are required in certain instances, as well as determining the basic root cause of the accident in spite of regulatory omission. This boils down to a review of the regulatory environment and related civil actions that, for the most part, rely upon regulatory expectations requiring specific actions and in this case, protective equipment. In opposition, the ongoing purpose is to review which actions taken by a variety of parties could have prevented the incident in spite of regulatory expectations. Simply put, we are at the heart of true risk management and accident prevention, which goes beyond the regulatory environment and into the conceptual question: Is it safe? This somewhat simple concept forces one to analyse the activities and possible improper uses of equipment, looking into the specific training of individuals to operate within the confines of set limits. In this respect, a review of the equipment, employers, OSHA regulations, state regulations and consensus documents will be undertaken. Historically, employers have always faced the basic economic reality of what is good and what is required. In this simple proposition, decisions are made that can affect the outcomes. In this case, various documents involving the accident itself, the variety of regulations and consensus standards that are involved with the equipment were reviewed. Best management practises were also involved, in an attempt to gain insights into general expectations for protecting rollers. The basic hypothesis utilised at the onset of the investigation was that use of a ROPS on all construction equipment, in this case rollers, would have prevented the tragedy. This again assumes that the seat belt would be worn. Perhaps the essence of this review and the investigation boils down to the following question, often asked of technical experts and consultants by employers: ‘Should we provide ROPS on all of our rollers’? When answered, ‘Yes, you should’ the next question that often follows is, ‘Are they required’? Only to be greeted by the reply, ‘Yes, you should because it’s an effective form of protection’. This type of questioning and review is undertaken daily in the workplace. Addressing the issues raised can certainly lead to the prevention of tragic accidents. Being extremely familiar with the site, site conditions and information made available relating to the tasks, equipment and operations that day, a unique perspective of the events was possible. Interviews with the supervisor, co-workers on site and other employees of the site contractor were possible, including discussions with the owners. As part of its investigation, OSHA felt that a general duty of the site contractor was breached when a roller compactor was used on site without ROPS. During the interview process, they found there were other areas of the site that had been compacted where there were slight elevations. 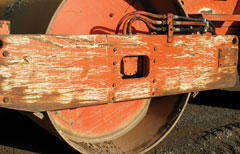 The single drum vibratory roller in question was originally sold in 1988 to a customer who used the vehicle with ROPS. The ROPS unit was a bolted on configuration that at some point was removed. The vehicle was sold without the ROPS to an authorised dealer. This dealer then rented the vehicle to contractors for use, including the site contractor involved with this incident. After several rentals, the site contractor elected to buy the unit and it was purchased without the ROPS. The dealer and all manufacturing information as reviewed indicated that ROPS was an option, but not required as part of the purchase nor in use. Manufacturing booklets, films, brochures and consensus documents listed no case requiring that ROPS be utilised. The use of ROPS was found to be a need dependent on the actual utilisation of the equipment. During the review period as part of the pending OSHA litigation, general surveys of contractors working on a variety of road projects clearly showed that at the time, approximately 50% of rollers in use did not have ROPS. Similar to the one on this project, these rollers were being used on flat surface paving and surface compaction. By invoking the General Duty Clause, OSHA determined that in its opinion that best management practise and typical use required ROPS to be on all such equipment regardless of use, and that it would have prevented the severity of the accident. While the severity of the accident would certainly have been prevented given the use of a seatbelt, the position of OSHA in instigating a ‘shall’ for the use of ROPS was not supported by the regulations. For OSHA to invoke a General Duty Clause violation, there must not be an existing standard available that specifically addresses the issue at hand. To invoke the Clause would require some source of information and/or practise that is typically followed in the industry, but not specifically covered in a regulation. In this instance, none of the consensus related documents for ANSI or other organisations specifically required the use of ROPS. The reference was always general and simply stated “if ROPS are available.” Further, the OSHA standard itself (29 CFR 1926.1000 subpart W, Rollover Protective Structures, Overhead Protection) while specifically listing certain types of equipment for inclusion, does not include rollover protective structure requirement for roller compactors. In fact, subpart a2 of the same regulation is telling in its omission of both the requirement and specific detail on the non-inclusion of compactors. This puts the utilisation of a General Duty Clause violation into question, since the standard specifically addressed the issue and at the time of writing had not changed. It should also be noted that as of this writing, it would be difficult to find a roller compactor sold or utilised without ROPS. At the time of the accident/investigation and OSHA litigation in 2002, however, it was further determined by a review of manufacturers’ service bulletins and recalls that no such requirement was put forth regarding ROPS to be added to such equipment. All of these items and the review of literature determined specifically that ROPS were not a required option to be used in every instance on roller compactors. The use of ROPS was purely deemed necessary according to the type of work and the location in which the unit was being utilised. It should be further noted that a smooth drum roller would not be used on a graded slope since the drum cannot grip and would slide, creating a problem with or without ROPS. In such a case, a different compactor which would be used, with a roller configuration allows gripping of the surface. Even in these cases, manufacturers’ incline requirements would need to be followed to prevent tipover. The OSHA regulations really provided a ‘should’ notion and not a ‘shall’, and the regulation was not found to be in force as a citable matter. As a result of litigation, the General Duty Clause was not upheld and the citation vacated. This, however, certainly did not change the outcome of a tragic accident. Going further, State regulations now become prominent as they relate to a ‘should’ requirement at the local level. In this case New York State (NYS) Industrial Code Rule 23 was used as the basis for civil litigation, alleging that a defective condition occurred in the roller compactor without ROPS. The OSHA regulation was not a referenced item, but specifically NYS Code Rule 23-9.2: General Requirements (h) Rollover protection required was invoked. This State regulation, which empowers the New York State Labor Law as it relates to liability considerations, also does not specifically list roller compactors. A simple reading of this State regulation shows that it does not include specific reference to roller compactors, but does list other equipment specifically. Expanding the interpretation, the terms ‘excavating’ or ‘grading equipment’ become prominent in this review. Are roller compactors excavation and/or grading equipment? Debate here ensues in that roller compactors “provide static and dynamic forces to increase load bearing capacity.” As such, this definition indicates that rollers do not obtain grade, but rather compact the surface as part of preparatory activities. Rollers do not push material, but rather compact it. Whatever personal opinion an individual may have that relates to these ambiguous references, there is no specific detail requiring ROPS on rollers in the instance of flat surface paving. That doesn’t make it right from an accident prevention potential, and it does not provide us with the ‘shall’. Rather than a ‘should’ or ‘shall’ when it comes to ROPS requirements in roller compactors, there is instead an inference made in the documentation reviewed discussing ROPS as an option and that when in use seatbelts should also be used. Nowhere in the regulations or consensus documents is there a requirement that states ROPS will be available and in use on such equipment. After this review it becomes apparent to a knowledgeable person that something is missing. Where along the way did a failure occur that allowed the piece of equipment that could be put in a position of jeopardy to not have ROPS requirements? When we look at the design of equipment we should look at not only its use, but also anticipate its potential misuse or errors in operation that cause accidents. While designs certainly have their limitations and utilisation, is there such a limitation when considering the requirement to have ROPS on roller compactors? The employer The employer had several roller compactor units, most of which had ROPS provided. The units with ROPS were used for the heavy construction operation where inclines could be present and training specifically addressed the use of that equipment in those instances. The employer did have a training programme where these items were specifically reviewed with operators. Based on interviews it was generally known that the standard operating procedure required the use of a roller with ROPS in those instances. The employer had units without ROPS that were used for flat surface paving, as was the intent in this instance. That, however, did not guarantee that the accident would not develop as it did. The employee The employee who suffered the catastrophic accident was done with work at the time. He had made arrangements to have several trucks of fill that was not needed on the site delivered to his home, for a project grading a driveway. It is very possible that his mind was on the arrangements of getting the vehicle released from the site so he could leave and conduct those other activities. At the time of the accident the supervisor had left the site, assuming that the injured employee was leaving or had already left. At the time of the accident he was operating the vehicle going down the side of the road at the crown of the hill, passing alongside his co-worker who was using a front loader to clear the back road of any debris prior to his own exit. At some point, possibly due to operator inattention, the unit went over the crown of the hill on wet grass, sliding uncontrollably and ending in the upset condition. The equipment Interviews and testimony from employees, supervisors and owners clearly indicated that rollers without ROPS were not be used on any inclined surface and that there was no such intent or instruction given to do so. The roller was originally sold with a ROPS unit but on a second sale the unit was sold without ROPS to an authorised dealer who rented and finally sold it without ROPS. No service bulletins or follow up information were communicated to any party, indicating that ROPS should be provided with updated equipment made available. As indicated throughout the review, no regulation or requirement was found to have ROPS on all roller compactor units as a general requirement. The root cause of this accident is multiple in its tentacles. First, the industry should have recognised the need for ROPS as a required component on roller compactors, given their general use and the possibility of mis-use or misapplication. Further, when the unit was sold the ROPS should not have been removed and the bolted on structure should have been a welded on structure to eliminate the potential for removal. This type of unit would not be used in low overhead conditions and there would be no need for removal of the unit, thereby eliminating the bolted on configuration. The industry plays a major role in the root cause of this incident. There is however, not just one cause, but rather multiple sub-causes. Regulatory bodies provide the next causal relationship. None of the regulatory bodies have a specific requirement detailing ROPS. Further, while the specific equipment is listed for those requirements and roller compactors are not included, the regulation needed to be reviewed and expanded to cover utilisation, not just equipment type. The OSHA regulations have not been amended since 1972, with no offering made as of the time of writing. This omission is glaring and offers no regulatory push for compliance with a protective system that can be seen as needed. Finally, the employer. An employer should always review their operations and consider not only the utilisation of equipment, but also its possible mis-use or misapplication. While training is important and in this instance had been completed, the failure of its compliance was seen in the result of the fatal accident. The employer needed to review the use of equipment. As indicated earlier, when questions were asked such as ‘Should we have the equipment on’? the answer was of course, yes. The problem occurs in answering the follow up question: ‘Is it required’? - with the answer at this point, being ‘No.’ Actions taken after that put the ‘should’ and ‘shall’ into perspective and in this case, the wrong decision was made. If ROPS had been provided on the roller compactor and the operator had been wearing a seatbelt, the rollover of the unit would still have occurred, but the fatal result would have been avoided. Given those facts, it is clear that the root cause of the accident was the unavailability of the ROPS on the unit, whatever its utilisation. The sub-causes of a lack of manufacturers’ input, lack of regulatory or consensus body requirements, and finally an employer’s misapplication of the ‘should’ and ‘shall’ led to this tragic occurrence.